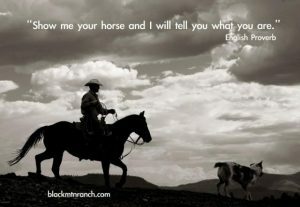 HORSE SENSE: Talk is Cheap; Show Me; Don't Tell Me — Life Lessons Learned from Horse Trading — by Mancos MacLeod | RANGEfire! 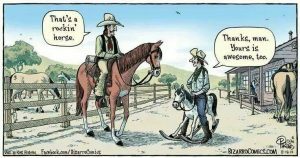 I’ve been around horses and horse trading essentially my whole life. (See Memories of Jack Walther). 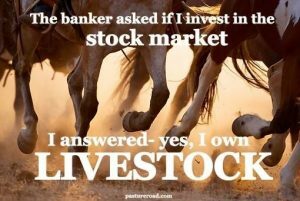 And believe it or not, valuable life lessons can be learned from horse trading. At this point, after a market crash, followed by a significant multi-year slump, the horse market seems to have rebounded, and has a serious bounce in its step right now. According to the Horse Sale Update from Billings Livestock Commission in Billings, Montana, the horse market is actually hotter right now than it has ever been. So my good friend Porterhouse Rockwell and I decided it was time to start testing the market a little bit locally, both buying and selling. We had a few good ranch geldings hanging around waiting for just this moment. It’s amazing who’s buying horses these days. Lots of empty-nester women are looking for a good, seasoned ranch horse. 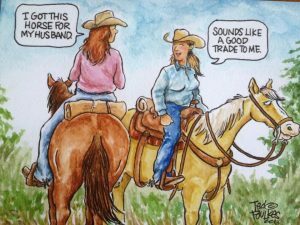 And the next thing they want is a “husband-safe” horse that their husband can get along with once in awhile to go along on a ride with them. Then Rockwell told me a story. 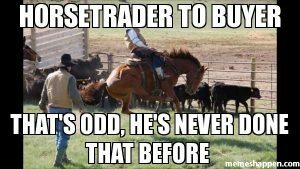 He said a guy had called him up looking for a good ranch gelding. According to the prospective buyer’s description of himself, “back in the day, I was a hell of a hand with a horse.” Rockwell went on, “Well, he came and looked at my horse, liked him and paid good money for him.” Then, later, he called me up and asked me what kind of bit I was using on the horse. I told him a ring snaffle. He hemmed and hawed around for a few minutes, and then asked “exactly what is a ring snaffle?” Rockwell chuckled, noting that it’s only the most basic, common bit used on horses — “some hell of a hand he was,” he concluded. And that brings me to the whole point of all this — from my old horse-trading friend, Ward Montgomery, or “Diamond W” as we like to call him. Diamond W is an ancient, old-fashioned horseman from New England, and started out in the cavalry before it was completely disbanded following WWII. He moved West about 25 years ago to spend the waning years of his life chasing his cowboy dreams. Once Diamond W got out West he said it didn’t take him long to figure out that when it comes to cowboys and horsemanship there are lots of talkers. But talk is cheap. And fancy trucks and trailers mean nothing when it comes to actual horsemanship. He said he spent his first 10 years in the West listening to guys standing around in fancy cowboy clothes, with all the trappings, including expensive trucks and trailers, bragging about their horses and horsemanship — kind of like politicians and political candidates talking about themselves, who they know, what they’ve done, and what they’re going to do — without anything real to actually show. What I have learned is that this approach also applies well to a lot of other things in life — and especially government, politics, and political candidates, who notoriously like to talk about themselves, who they know, who they’re related to, what nice, All-American people they are, complete with baseball and apple pie, and what they can do. But what have they done? I’ve learned that Diamond W’s litmus test is still the best: Talk is cheap. Just show me your horse. Actions speak louder than words. So don’t tell me. Show me. Just shut-up and show me your principles. Show me what you stand for, not based on what you say, but based on what you do. Show me the fruit of your labors, and I’ll draw my own conclusions. Show me what you have done and accomplished — because in the end the proof is always in the pudding. Show me your horse and I will know who and what you are. Valuable life lessons learned from horse trading. Very true and on point. 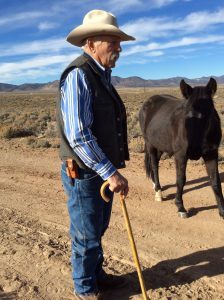 When I was shoeing up at Tom Dorrance’s ranch 20 years ago; I heard him say “the horse knows when you know, and the horse knows when you don’t know”. Show me your horse.